OK, so those of you who’ve been waiting for more video can be temporarily sated with this 1 minute (9.5MB) clip which I shot while walking down the Kings Road yesterday afternoon. 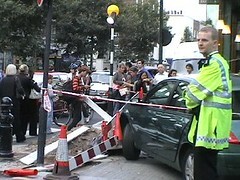 What is bizarre is the angle at which the car had gone through the window of Cafe Nero. It was difficult to imagine that it had been going so fast up the side street, but that’s the only direction it can have been coming from unless it was spinning out of control in which case you’d expect more collateral damage to other traffic. My favourite bit is all the mobile-phone wielding bypassers doing their thing for citizen journalism! Just in case you thought Chelsea was boring these days.